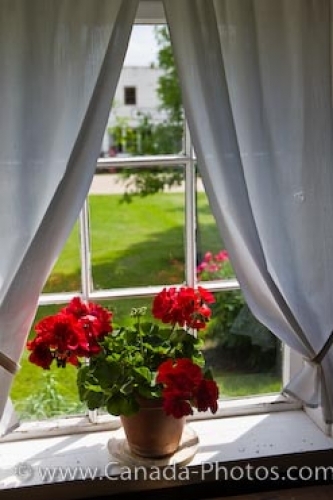 The red potted flowers decorate a windowsill in the historic Hochfield House at the Mennonite Heritage Village in Steinbach, Manitoba in Canada. Red potted flowers sitting on the windowsill inside the Hochfield House at the Mennonite Heritage Village in Steinbach, Manitoba, add a colorful edition to this historic home. The white curtains are draped nicely around the old window which looks out to the gardens and other historic buildings in the Mennonite Heritage Village. The Hochfield House in one of the earliest log buildings in the Mennonite Heritage Village dating back to 1877. Created by a married couple, Johann and Katharina Wiebe, the Hochfield House has had numerous renovations done over the years and was lived in until 1985. Red potted flowers on the windowsill of the Hochfield House (1877) at the Mennonite Heritage Village, Steinbach, Manitoba, Canada. Picture of red potted flowers on a windowsill at the Hochfield House at the Mennonite Heritage Village.